Rendering of restoration and additional stories at 29 Greene St., Manhattan. Image Credit: Gertler & Wente Architects. Planned four-story addition will reconstruct the historic cast iron facade, add contemporary set-back penthouse. 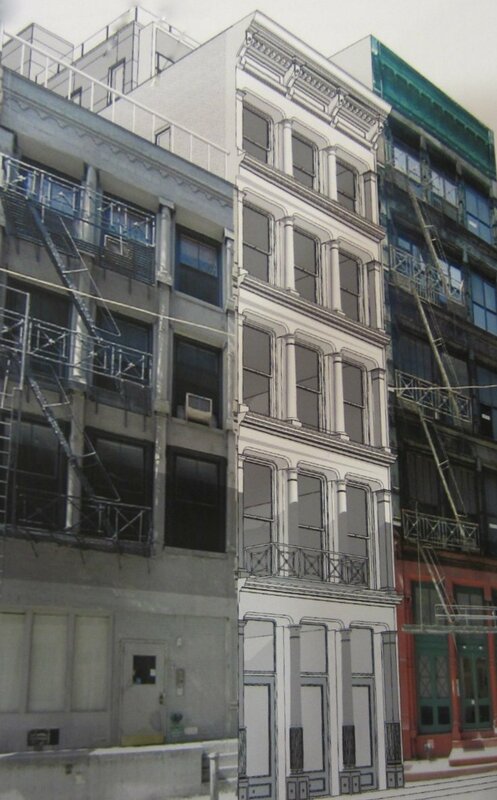 On August 13, 2013, the Landmarks Preservation Commission considered and approved a plan to add four stories to an existing building at 29 Greene Street, Manhattan in the SoHo-Cast Iron Historic District. The building, completed in 1878, originally stood at four stories, but a fire reduced it to its current height of two stories. The building will be used for office space with ground-floor retail use. In considering a plan for the site, architects determined that enough historic fabric and detail remained on the existing building to retain and restore the cast iron elements on the extant two stories, while replicating its facade on the upper addition. The design for the cornice was drawn from cast-iron buildings of the same time period in the neighborhood, and would likely be made of sheet metal. Three new doors would be installed on the ground floor, and a non–historic sidewalk vault would be removed, while piers and transoms would be restored. The penthouse story would be clad in cement panels, and the sidewalls and rear facade of the lowers stories would be faced in red brick. Wente said they had made the decision to set back the sixth floor because six stories at the street wall would not be a common archetype for a twenty-foot-wide lot. Owner Laure Debreuil said she was excited for the opportunity to restore “such a beautiful gem.” A representative of Manhattan Community Board 2 read from a resolution that generally recommended approval of the projected, but objected to the removal of a loading dock from the property. The Historic Districts Council’s Nadezhda Williams also found the plan generally appropriate, but urged the applicants to use cast iron for decorative elements. Commissioner Fred Bland found the reconstruction in the historical idiom a “perfectly plausible” approach to development, and found the penthouse’s visibility not to distract from the main building. Commissioner Joan Gerner agreed on the appropriateness of replicating existing material, and called the proposal “very sensitively done.” Vice Chair Pablo Vengoechea generally concurred, but thought the penthouse should be reduced to minimize visibility, and that cast iron, rather than sheet metal, should be used for the cornice. Vengoechea also thought some aspects of the materials should be reconsidered, in particular the meeting of the brick and the cement panels. Chair Robert B. Tierney found the proposal approvable as presented, but asked the applicants to consider lowering the penthouse, and to look at the materials again with Landmarks staff. Tierney then led a unanimous vote for approval. LPC: 29 Green Street, Manhattan (14-5361) (Aug. 13, 2013) (Architect: Gertler & Wente Architects).